I would like to discuss some issues that have come up in recent weeks with the new Gen 6 car. These issues seem minor, but with this new car, they need to be addressed. And because these issues are issues, it leads to a conclusion that is kind of stunning in my mind. Two issues revolve around Denny Hamilin. The first is his $25,000 fine for “criticizing the product.” and I’ll get to that in just a minute. The other one is his massive L1 Compression fracture that he suffered at Fontana. This injury should never have happened, but it did. The Gen 5 cars, as unattractive as they were design-wise, were safety-focused. The discussion on how safe they were ended with Michael McDowell’s scary wreck during qualifying at Texas in 2008. The car suffered serious damage, but McDowell was unhurt. This wreck was just as bad, but Hamlin is out of the car until he is fully healed. 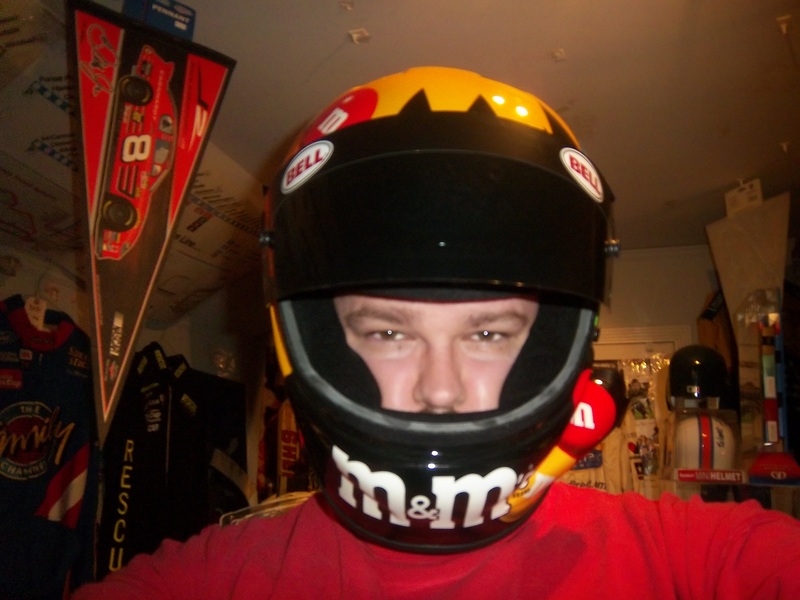 NASCAR needs to be safety-focused, putting driver and fan safety before anything else. The fact that Denny has an L1 compression fracture because of a wreck is proof that there is a lot of room for improvement in the Gen 6 car. That isn’t the only issue with the car that needs to be addressed. The car seems to change with each race. At a super speedway, the spoiler is lower than it is at other tracks. At intermediate tracks the roof cameras are not used for reasons that have yet to be explained to the general public. It almost seems as though NASCAR is making the rules up as they go along. Please pick a design and setup and stick with it. The other issue that needs to be discussed is penalties surrounding the new car. Denny Hamlin was fined $25,000 for saying that the car has room for improvement. Why was he fined for that? I understand that the car was designed by many different people, who put a lot of time and effort into it, but here is the thing…the people who designed the car are not the ones who are the focal point of racing, the driver is. If the drivers are complaining about the car not being competitive, and not driving the way it is supposed to, it should be addressed. The Gen 4 and Gen 5 cars went through a lot of refining, and so should the Gen 6 car. One penalty that was issued was to Penske Racing for having suspension parts unapproved by NASCAR. Although all of Ford’s engines come from Roush Yates, many teams use their own designs for equipment used in the car. As such, these parts have to be approved by NASCAR. Obviously these parts weren’t approved. Yet Penske, Brad Keselwoski, and Joey Logano are swearing up and down that they were legal, and working in a gray area. 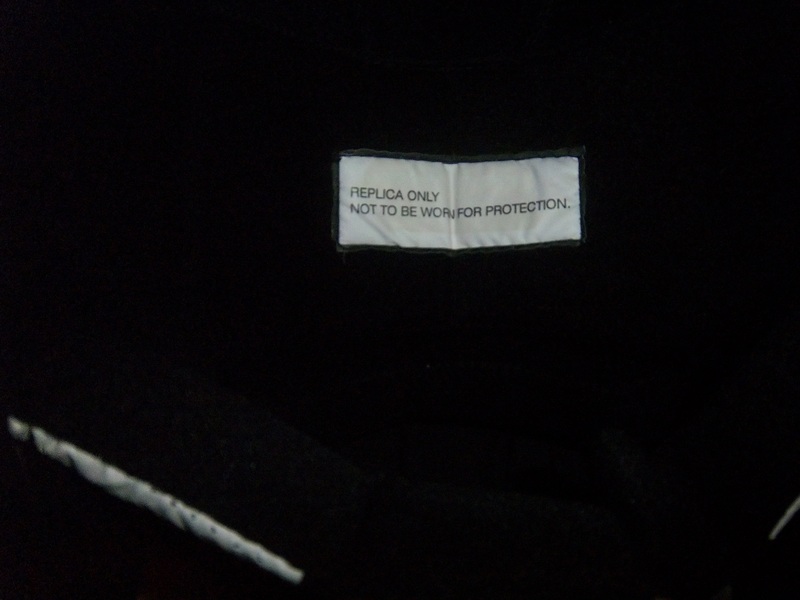 If the parts are unapproved, they are unapproved. The other major penalty was to Matt Kenseth for having a connector rod that was 3 grams under the minimum weight required by NASCAR. My concern with this issue is that the engine in question came from Toyota Racing Development. TRD knows what the rules and regulations are, and they knew what the parts should have been. I do not believe for a second that of the people involved with making the engine, not one of them knew didn’t realize that the parts were illegal. They knew what it was, and they sent it out anyway. That brings up an important question. 8 teams in the Sprint Cup work with TRD. In total that accounts for 10 different teams. Each team has a primary and backup car. There is also an additional engine at the teams disposal. So for each Toyota team there are 3 engines for use. If Matt Kenseth is running illegal equipment, who else is? Kevin Harvick Bell Helicopters Chevy SS A simple design with a good color scheme. Not much else to say other than good job, and it gets an A grade. Jeff Burton #31 Airgas-Bulwark Chevy SS Meh. That sums it up. Uninspired color scheme, and bland design give it a mediocre look and a C- grade. JJ Yeley #36 NASCAR Day Chevy SS Another simple yet attractive scheme that works very well. Nothing more to say than great job, and enjoy your A grade. David Gilliland #38 EZ Pawn Ford Fusion Good color scheme though the design is a bit over complex. As such it gets a B+. Bobby Labonte #47 Pine Sol Toyota Camry Yet another simple yet amazing good scheme that earns an A grade! Elliot Sadler #81 Alert Energy Gum Toyota Camry A good scheme with a consistent design and a decent color scheme that earns a B+ grade. Every Great Outfit Needs Gloves and Shoes to Match! 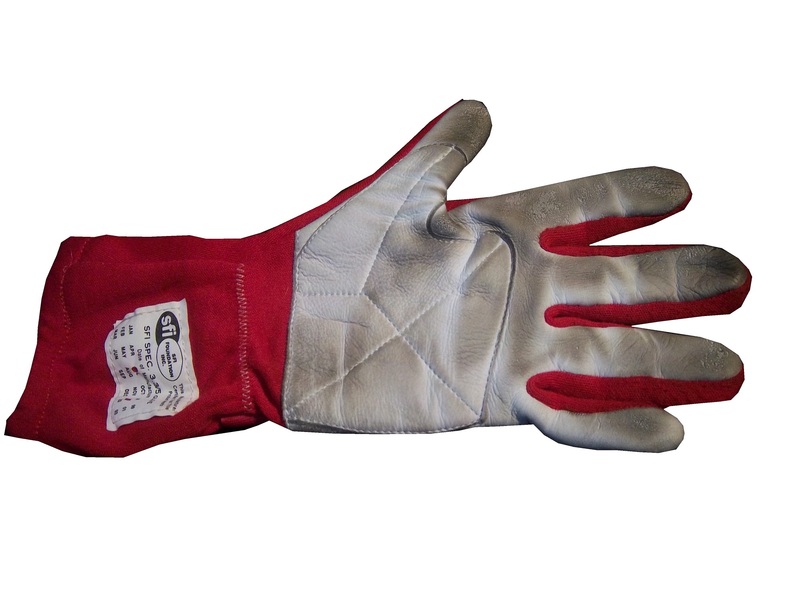 Since the fire risk in racing is as high as it is, it makes sense that driver uniform includes fire retardant shoes and gloves to go along with it. 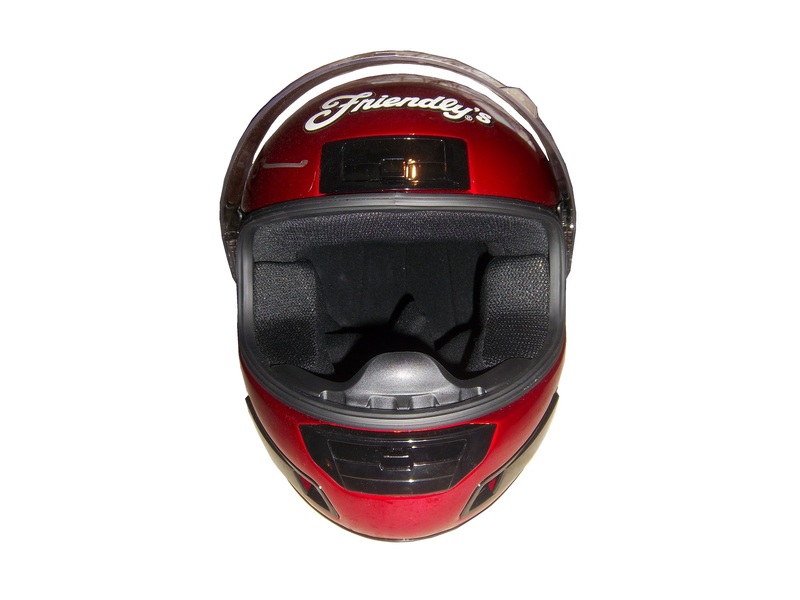 Although they are frequently overlooked by many fans, they are just as critical to driver safety and comfort as the suit and helmet. 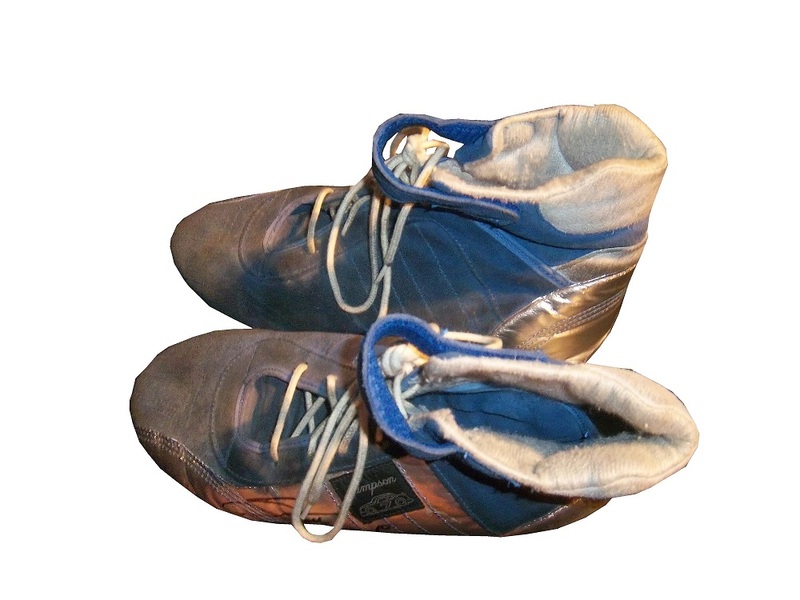 Gloves and shoes have, like the suit and helmet, become fashion forward in recent years. 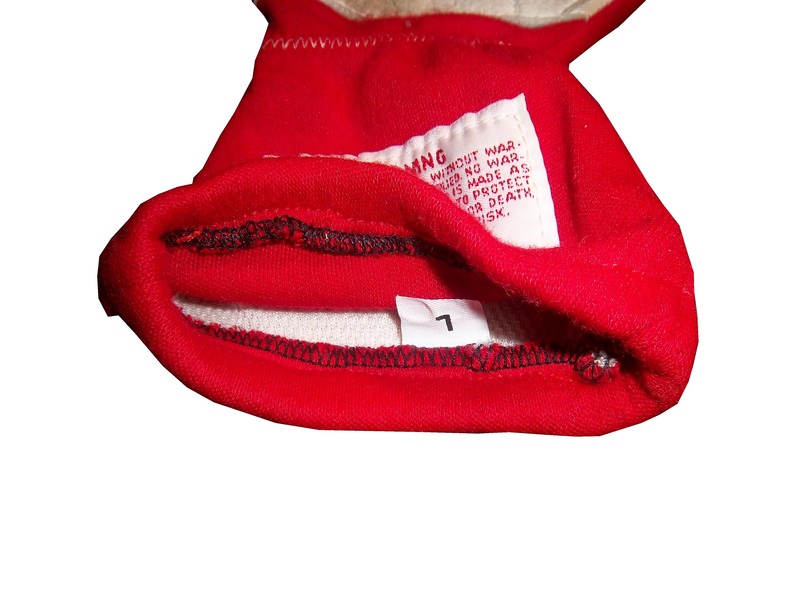 Let’s look at the gloves first. 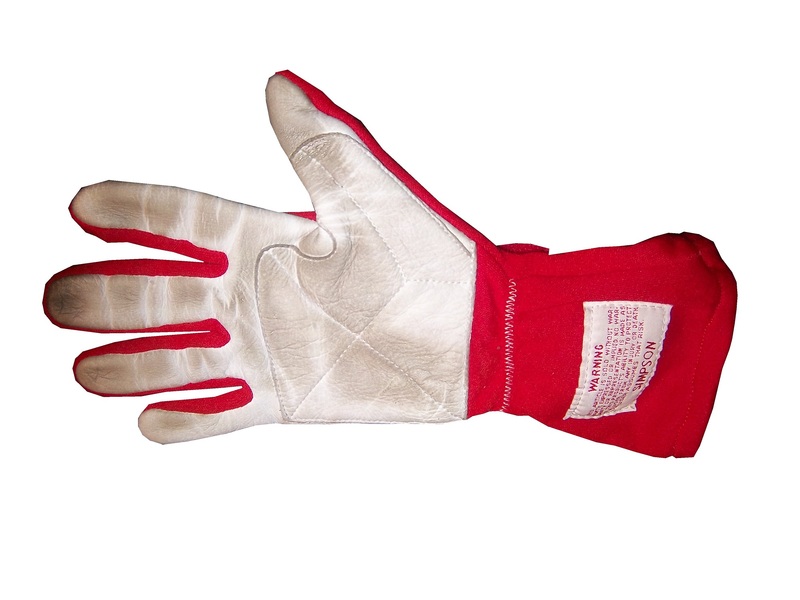 Gloves in racing are typically made of multiple layers of Nomex, and feature a textured layer on the palm, which is designed to help the driver grip the steering wheel. 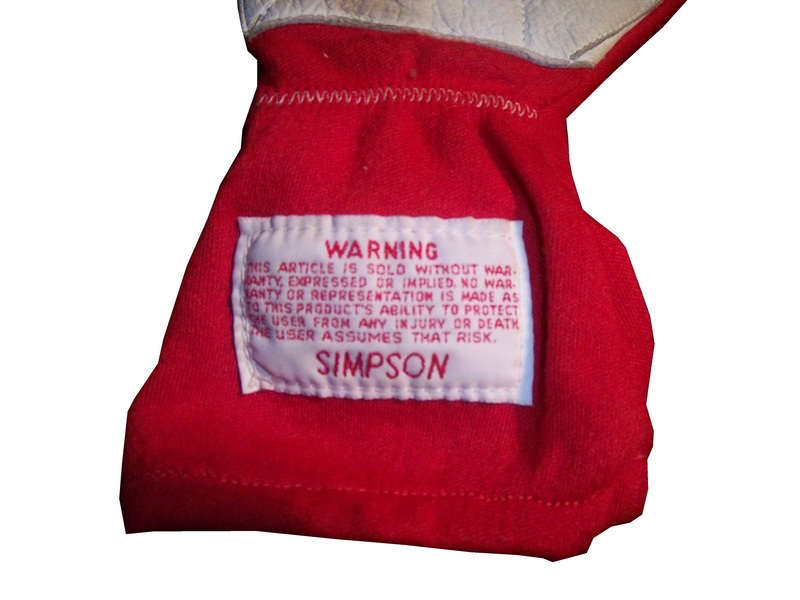 Gloves may be waterproofed for open cockpit racing, where rain and other inclement weather may not impede the race. 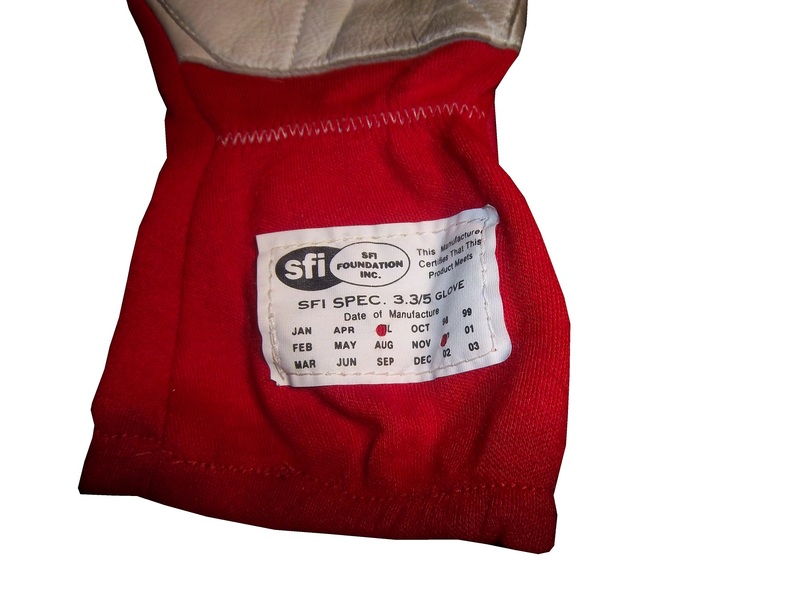 The gloves give the same amount of protection that the suit does, roughly 30 seconds, and are certified by FIA and SFI. 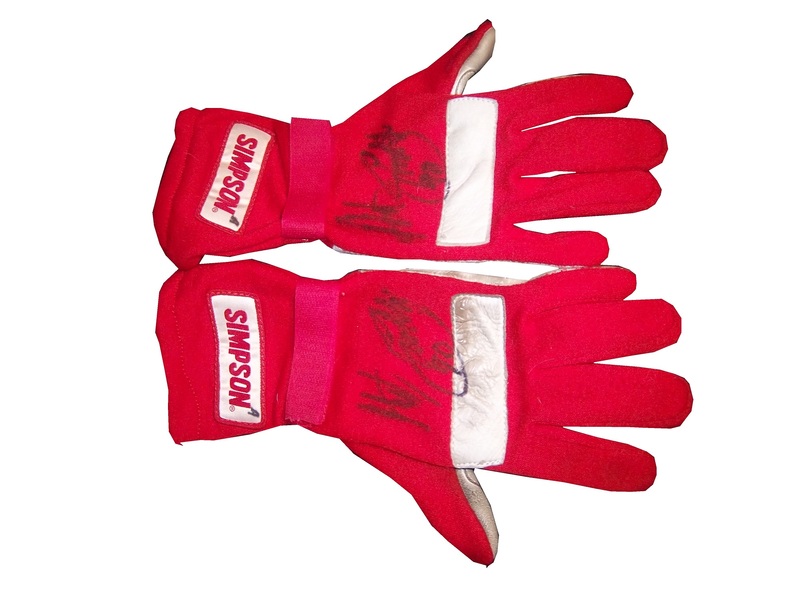 This example, worn by Hut Stricklin in 2000 shows the basics..
As I mentioned above, gloves have evolved to be more visible on in-car cameras. 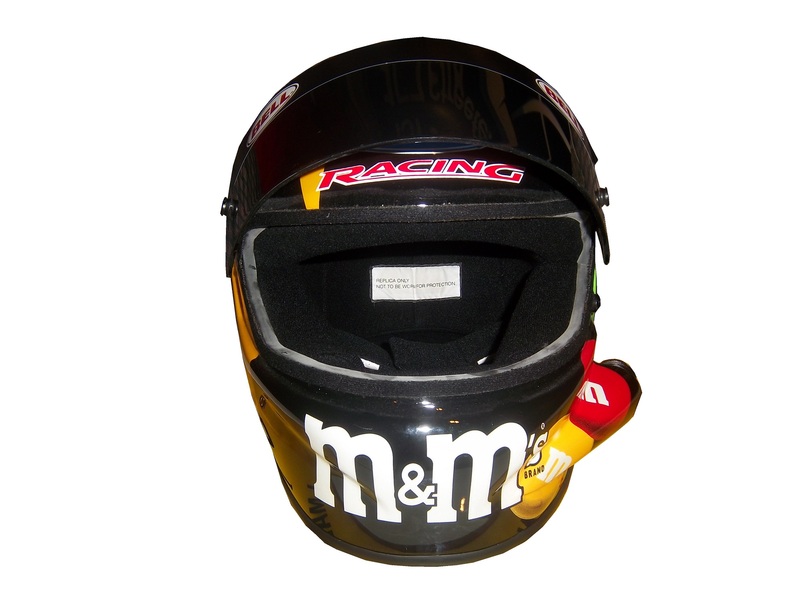 These examples, worn by Dale Earnhardt Jr. and Jimmie Johnson show how these new customizations can take a simple safety equipment item, and add some visual appeal to it. A search on eBay reveals that these items do wind up for sale after they are used. Next, let’s discuss the shoes. 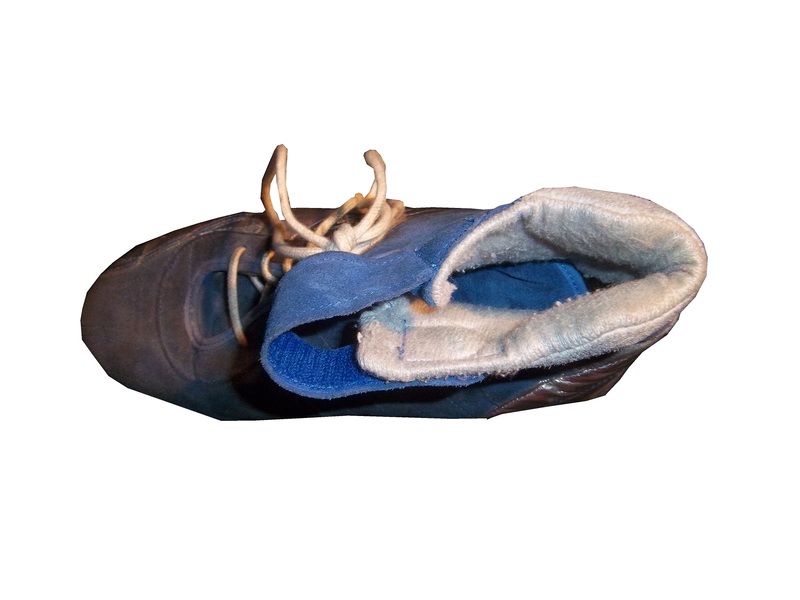 Shoes are as important as gloves in terms of fire protection. Those 30 seconds of fire protection are critical for the driver to get out of a burning car. 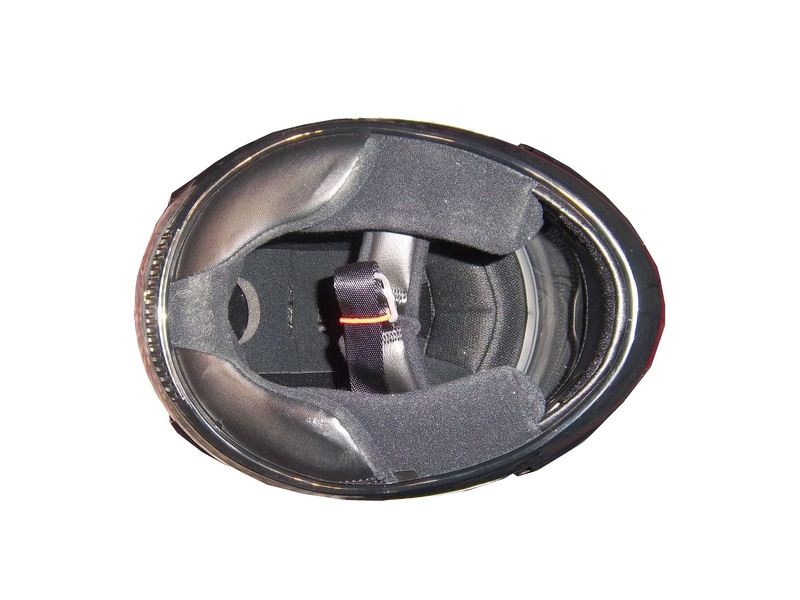 The basic design of the shoes are meant to help the driver, well, drive. 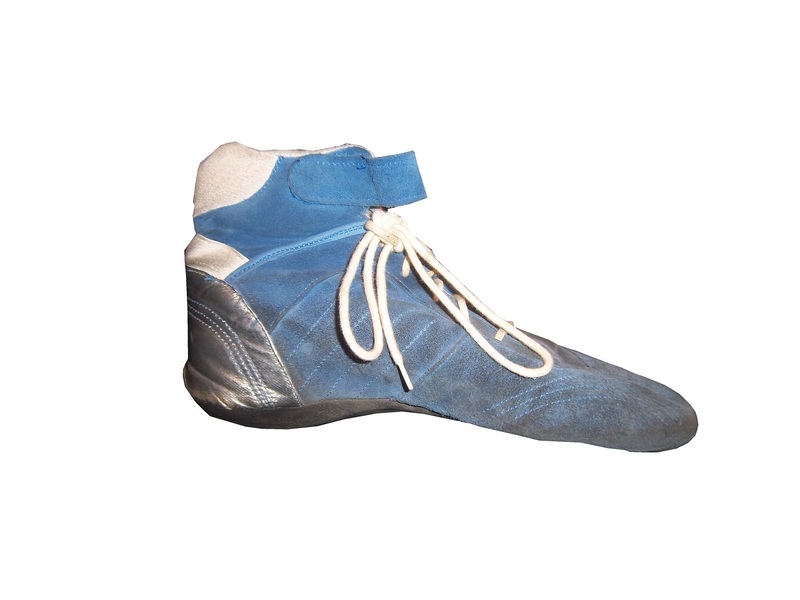 Some drivers in years past have opted for nontraditional racing shoes, such as Dave Marcus who was well-known for wearing wingtips while racing. 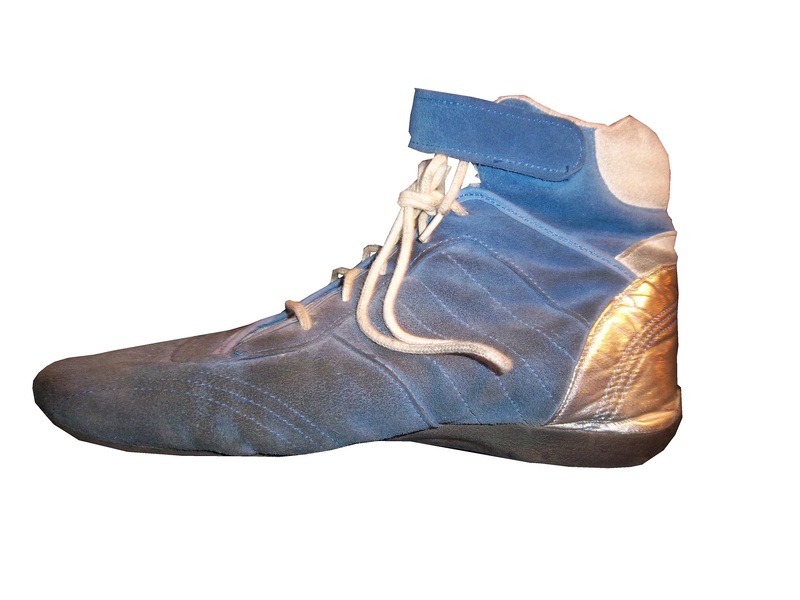 Typical racing shoes consist of a rubber, fire retardant sole, with triple-layer Nomex material covering the foot. 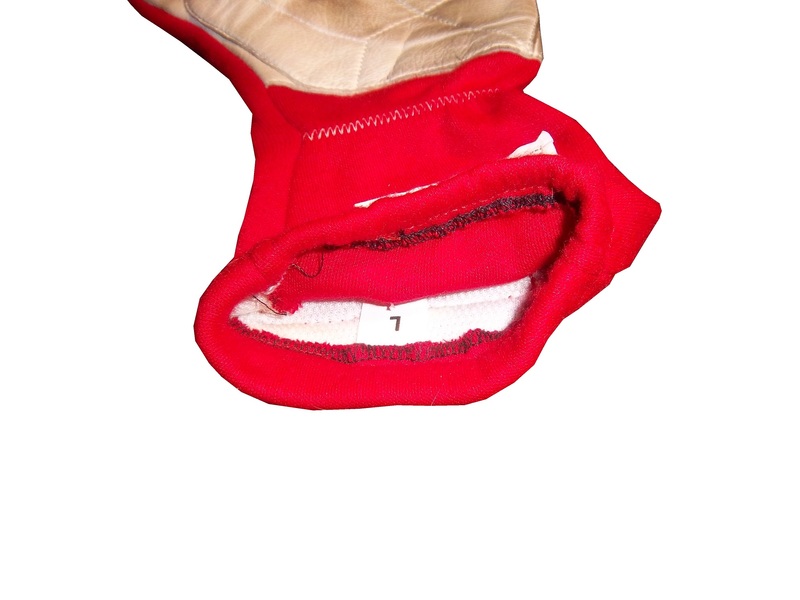 The tongue, and shoe laces are fire retardant as well. 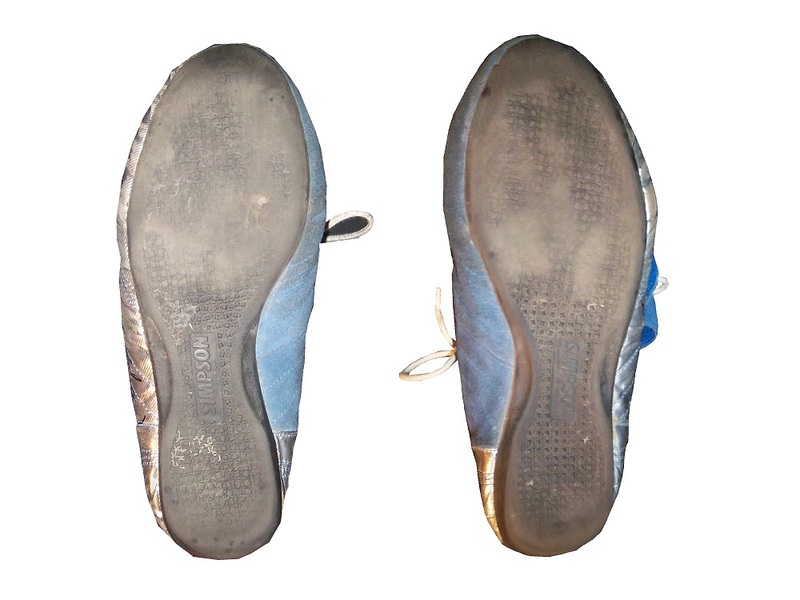 Velcro straps are frequently employed to secure the shoe as extra protection. 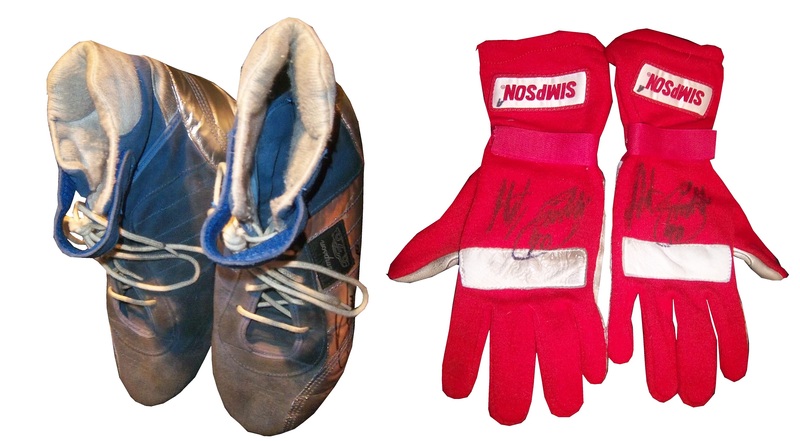 Let’s look at a race-worn pair, this pair worn by Scott Riggs in the early 2000’s. Kasey Kahne #5 Farmer’s Insurance 85th Anniversary Chevy SS It’s amazing how a color change can affect a scheme. I graded the standard scheme at a D+ earlier this year, and with the black red and tan color change it takes it from a D+ to an A-. Notice that there is no real difference between the two schemes except the colors and the new one is so much better! Kevin Harvick #29 Bad Boy Buggies Chevy SS I like this scheme for the same reasons as the Jamie McMurray Bell scheme, and it gets the same A grade! Landon Cassill #33 Justin Workboots Chevy SS I like the design scheme except for the primary sponsor logo is a completly different color than the rest of the car. The thing is that the two color schemes work very well by themselves, but the combo of the two just makes no sense. 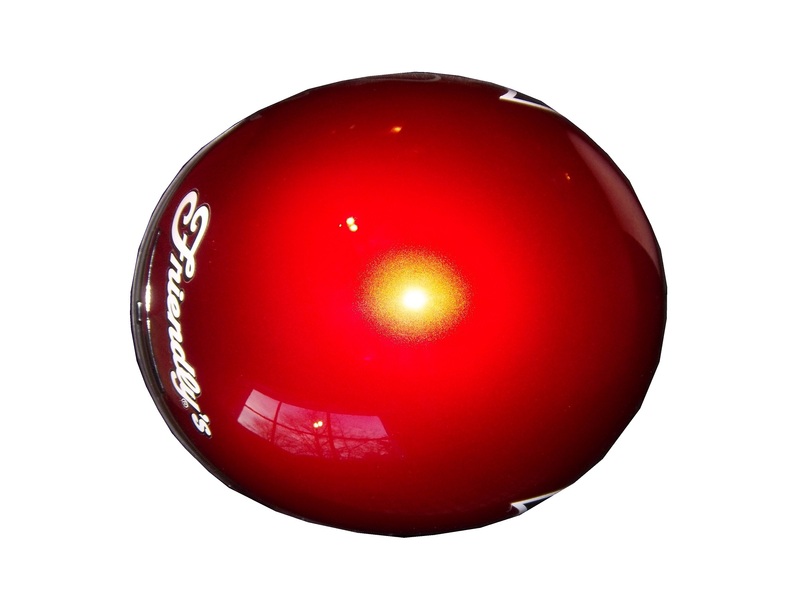 It takes an A scheme and brings it down to a C…PICK A COLOR SCHEME! 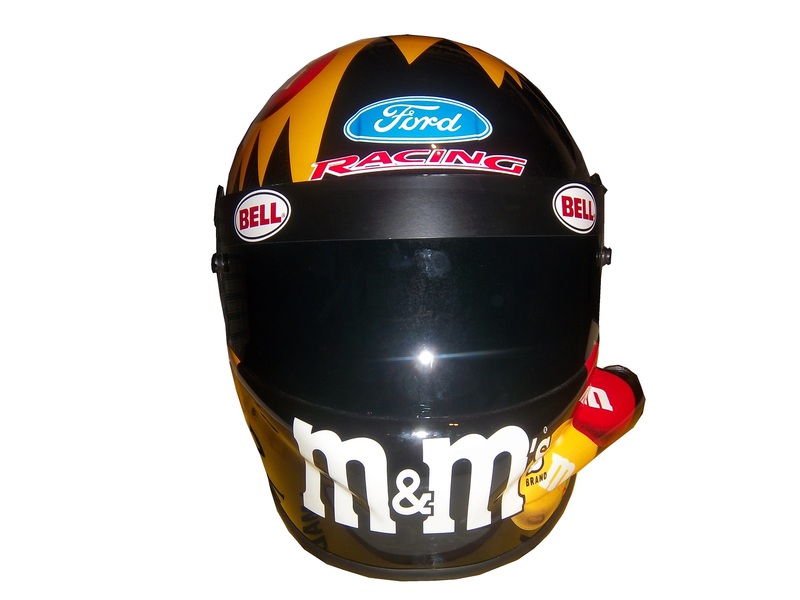 I had an article ready on driver shoes and glove ready for this week, but NASCAR came out and announced this week that the 2014 NASCAR Hall of Fame would be electing new inductees on May 22. So what I’m going to do this week is discuss each inductee in some detail, and add the 5 who I should be inducted this year, and the 5 that I think will be inducted this year. Red Byron-One of NASCAR’s 50 Greatest Drivers he is the first champion in what is now the Sprint Cup, Red Byron is considered one of the best drivers in the early years of NASCAR. After winning the inaugural NASCAR Modified championship, he took to the inaugural NASCAR Strictly Stock series. Although he only had 2 wins in the 8 races, he took the title. Richard Childress-The top team in the 1980’s and 1990’s Childress has the distinction of being the first owner to win a race in all 3 of NASCAR’s top series, as well as being the first owner to win a championship in all 3 of NASCAR’s top series. In total, in the top 3 NASCAR series, he has 6 championships and 193 wins. Jerry Cook-His work in the Wheelin Modified Series speaks for itself, 6 championships, 342 wins, and one of NASCAR’s 50 Greatest Drivers. 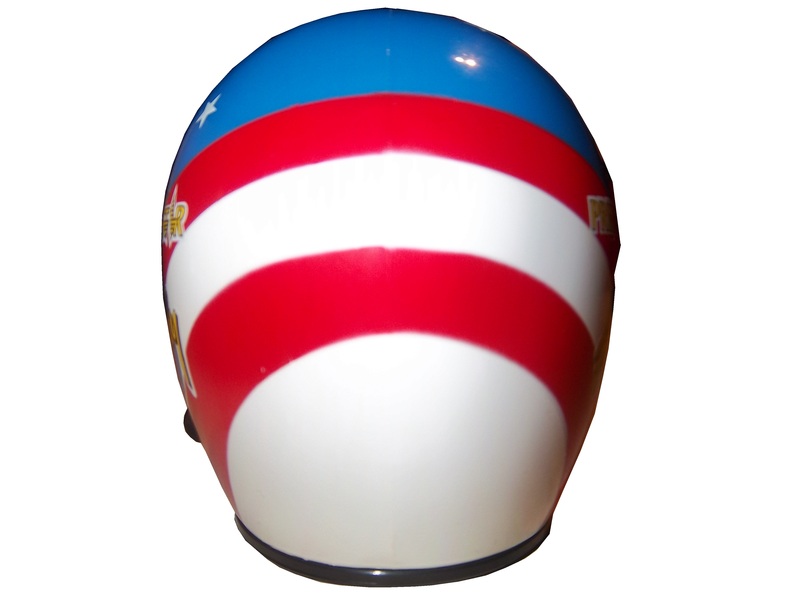 He is also known for having a rivalry with Ritchie Evans, who was inducted into the NASCAR Hall of Fame a few years ago. H. Clay Earles-The founder of Martinsville Speedway, Earles built Martinsville after witnessing the popularity of stock car racing at fairgrounds, feeling that a permanent track would be a profitable venture. Earles also began the tradition of awarding grandfather clocks to race winners, a practice that continues to this day. Tim Flock-Two time Sprint Cup champion in 1952 and 1955, he hold the record for most poles in a season with 18, highest career winning percentage for a driver with 21%. 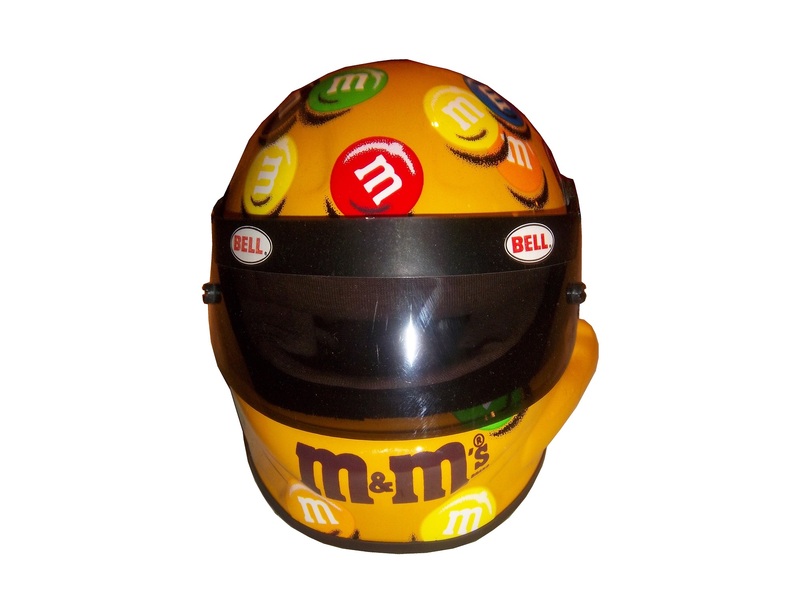 He is one of NASCAR’s 50 Greatest Drivers. Ray Fox-An engine builder who’s engines helped Junior Johnson win the 1960 Daytona 500, and the discovery that drafting at Daytona increases speed, Fox has 14 wins to his team as an owner, with 62 top 5’s 82 top 10’s, and 16 poles over 12 years. Anne Bledsoe France-Helped build the sport with her husband Bill France Sr, and is the first woman up for induction. Rick Hendrick-The top owner in NASCAR in the last 20 years, Hendrick has 262 wins in NASCAR’s top 3 Series, as well as 14 championships. Jack Ingram-A 2-time Nationwide Series champion with 31 wins, Ingram also won the Late Model Sportsman Division in 1972, 1973, and 1974. He is one of NASCAR’s 50 Greatest Drivers. Bobby Isaac– 1970 Sprint Cup champion who was well-known for racing the 1970 Dodge Daytona, Isaac has 37 wins, 170 top 10’s and 49 poles over 14 years. 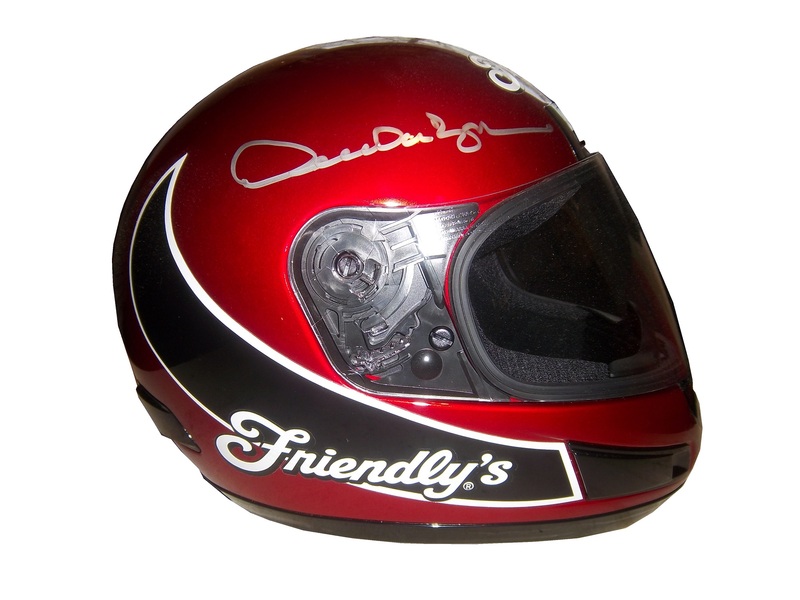 Isaac later took the Daytona to the Bonneville Salt Flats and set 28 speed records, many of which still stand. He is one of NASCAR’s 50 Greatest Drivers. Dale Jarrett-Son of 2011 NASCAR Hall of Fame inductee Ned Jarrett, Dale is the 1999 Sprint Cup Champion who also won 3 Daytona 500s and two Brickyard 400’s. 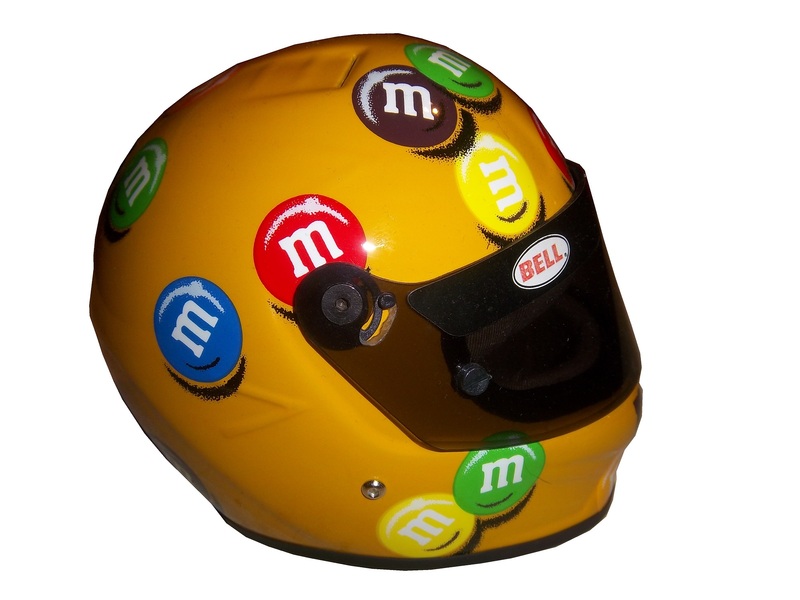 He is one of NASCAR’s 50 Greatest Drivers. Fred Lorenzen-26 wins to his name, Lorenzen also had a winning streak from 1962 to 1967, won the 1965 Daytona 500, and pulled the Yellow Banana stunt in 1966. He is one of NASCAR’s 50 Greatest Drivers. Raymond Parks-When Red Byron won the 1949 Sprint Cup championship, Parks was recognized as the owner of the team, the first team owner to win a Sprint Cup championship. Benny Parsons-the 1973 Sprint Cup Champion and the 1975 Daytona 500 winner, Parsons also has 21 wins, 283 top 10’s, and 20 poles in his career. He retired from driving and became a respected television announcer. He is one of NASCAR’s 50 Greatest Drivers. Maurice Petty-Chief engine builder for Petty Enterprises, and head mechanic for Richard Petty. For most of Richard’s 200 wins, Maurice was working on the cars. Larry Phillips-Raced from 1961 to 2001, winning the NASCAR Weekly Series Championship in 1989, 1991, 1992, 1995, and 1996, seven NASCAR Weekly Regional championships, and 13 track championships. Les Richter-An inductee into the Pro Football Hall of Fame, Richter was the vice-president of special operations for the International Speedway Corporation, chairman of the board for the International Race of Champions, Senior Vice President of NASCAR, and was working at Auto Club Speedway at the time of his death in 2010. Glenn “Fireball” Roberts-Won the 1962 Daytona 500, in addition to 32 other races. 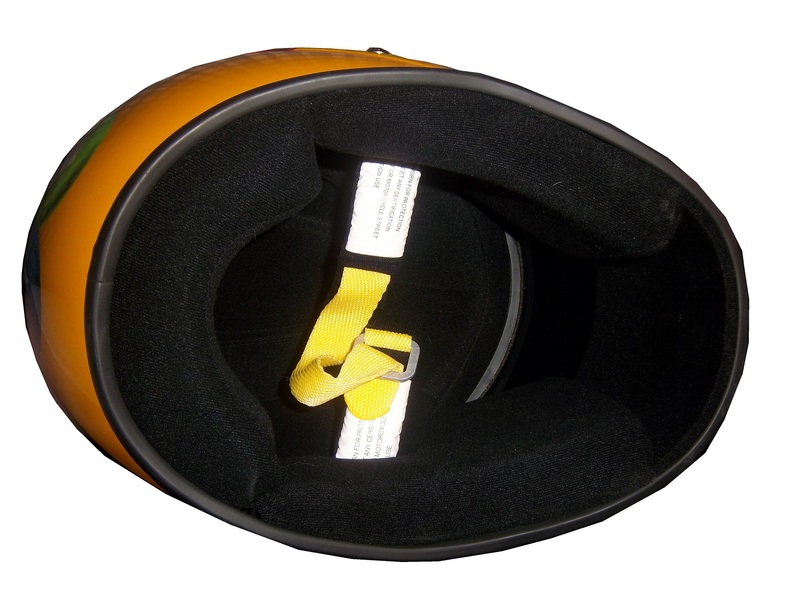 His death in 1964 helped lead to safer driver uniforms with better fire protections. He is one of NASCAR’s 50 Greatest Drivers. T. Wayne Robertson-Employee of RJR who helped promote the NASCAR Winston Cup Series by taking a show car to shopping malls, and other events, with a point standings leader-board. Wendell Scott-The first African American to win a NASCAR Sprint Cup race, Scott is a true trailblazer, not just in racing, but in sports as well. Ralph Seagraves-RJR executive who established the sponsorship of the Grand National series in NASCAR by Winston, forming the NASCAR Winston Cup Series in 1972, and would later go on to sponsor the NHRA as well. Ollen Bruton Smith-Builder of Charlotte Motor Speedway, and founded Speedway Motorsports which helped oversee expansion in NASCAR, Smith was also a promoter who would put on a show for the fans before races. Curtis Turner-Won 38 races in 4 years in the NASCAR Convertible Division, Turner would later win 17 races in the Sprint Cup Series. Turner holds the distinction of being the only Sprint Cup driver to win two flag-to-flag races back to back, leading a total of 400 laps in the two races in July of 1950. He is one of NASCAR’s 50 Greatest Drivers. Joe Weatherly-Won two Sprint Cup Championships, two Modified Championships, with 25 wins, 153 top 10’s, and 18 poles. He is one of NASCAR’s 50 Greatest Drivers. Rex White-1960 Sprint Cup Champion, with 28 wins, 163 top 10’s, and 36 poles. He is one of NASCAR’s 50 Greatest Drivers. Those are the nominees for the 2014 Hall of Fame class. Picking who I think should be inducted for the 5 spots is difficult. But Wendell Scott is a given, as is Jack Ingram. I would also give a nod to Rick Hendrick and Richard Childress here. And for my final pick, I’m going with Burton Smith. Who I think will get picked for the hall of fame is much simpler. Any driver who was named in the 50 Greatest Drivers is a safe pick. I would be shocked if Hendrick and Childress don’t get picked. So I think that Wendell Scott, Rick Hendrick, Richard Childress, Bobby Isaac, and Curtis Turner will get the pick. Joe Nemechek #87 ATI Gun Stocks Toyota Camry Seriously? What is the stone design on the sides, roof and hood? Is ATI selling stone gun stocks? If the design was only on the door frame, I would be able to stand it, but is just looks bad. Again an F! 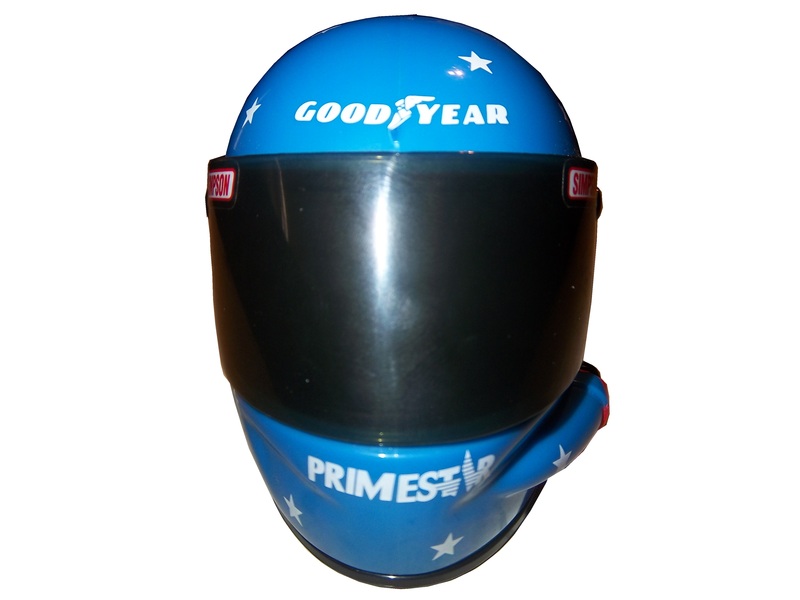 When I started this blog, I wanted to appeal to two different groups, racing enthusiasts and collectors. I think that this post should appeal to both groups. 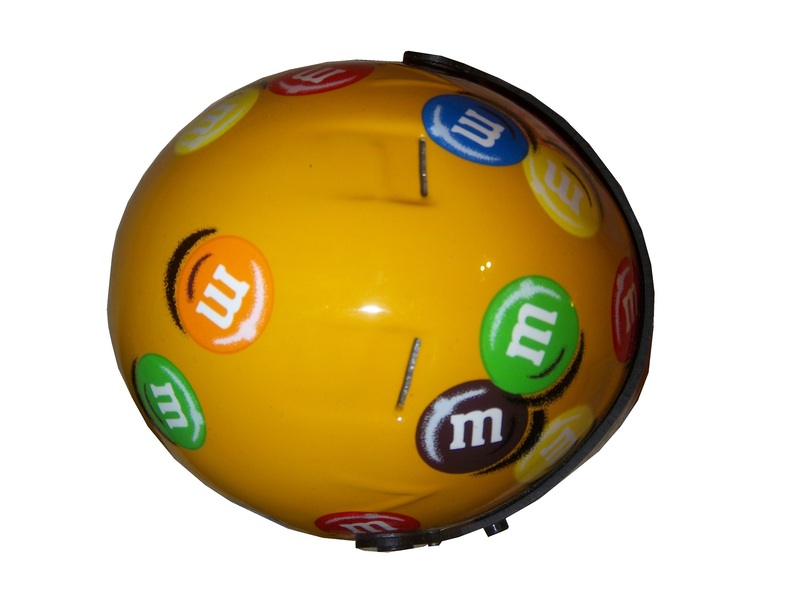 The MLB, NFL, and NHL have a product that is very useful, for autographs, and for fans alike…the replica helmet. 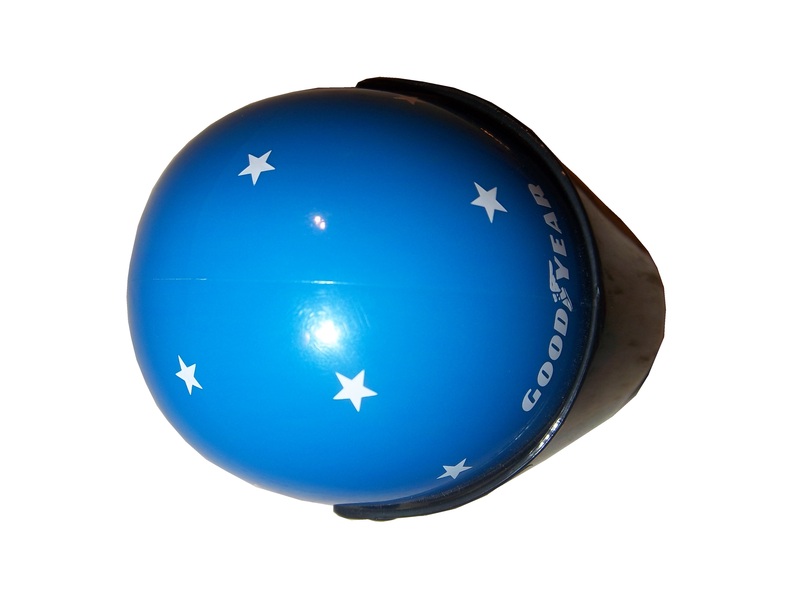 Replica helmets have been made for the NFL for over 15 years now, and baseball replica helmets date back further than that. 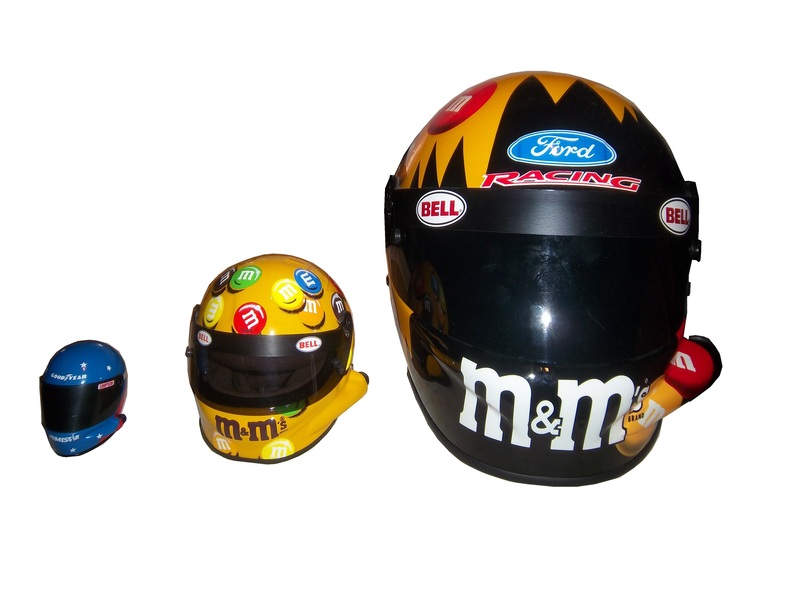 NHL minis, although more recent, are becoming a fan favorite…so why not racing replica helmets? This has been tried before. 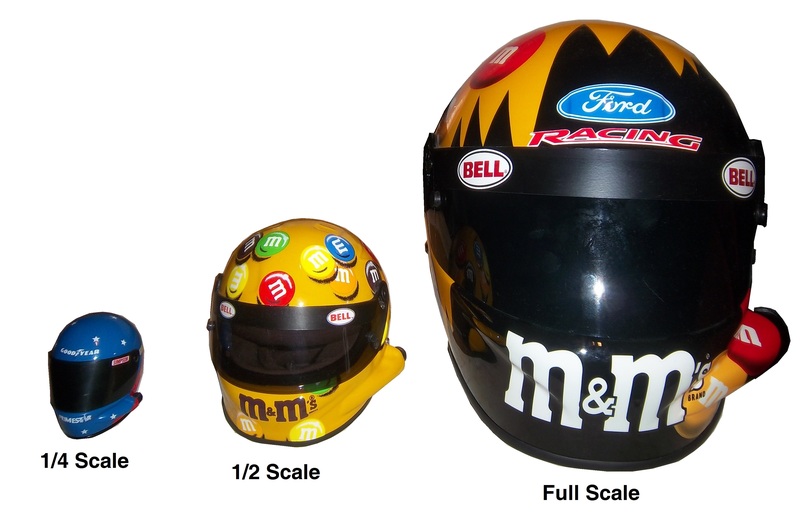 In the late 1990’s Simpson released a series of ¼ scale mini-helmets. 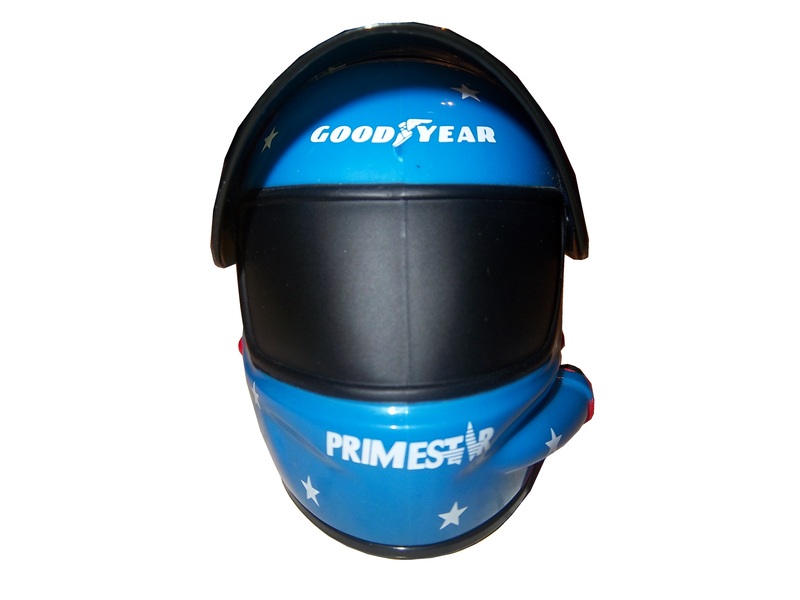 These helmets were reasonably accurate replicas of the real thing, but only 3 inches long. 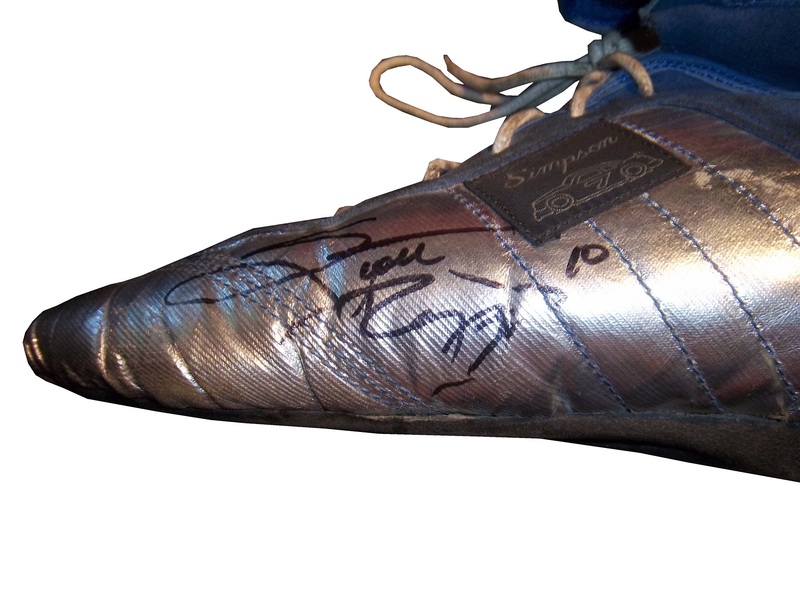 Although the design was good, the product was costly for the time, and very small, which made it very impractical for autographs. 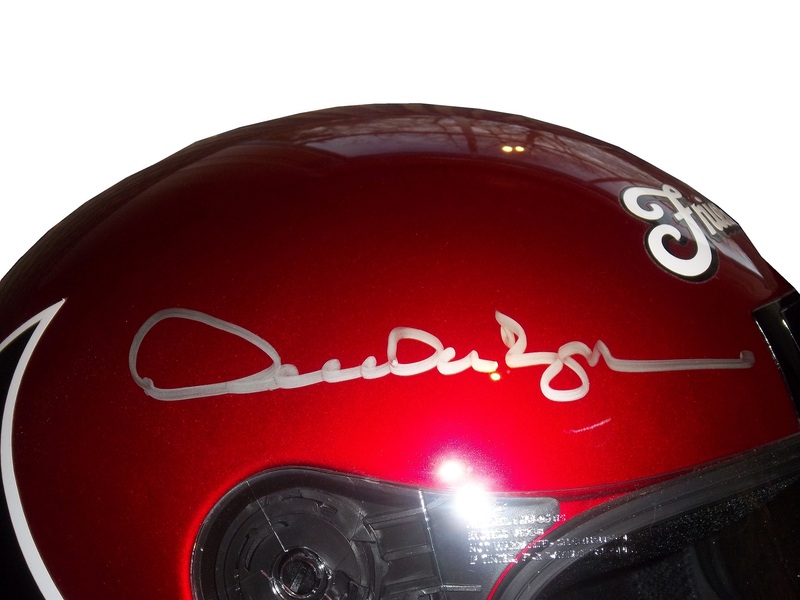 The autograph issue is important because something that mini-helmets in baseball, and football are frequently used for autographs from players. 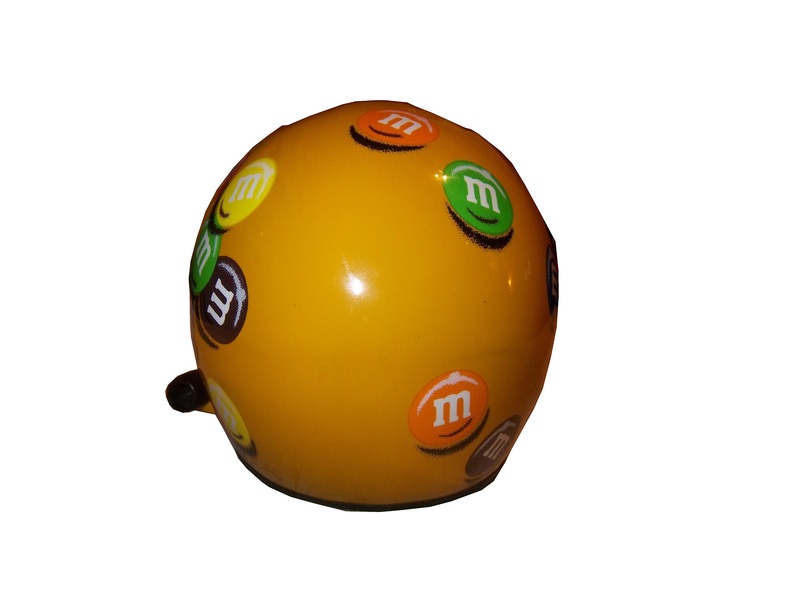 These helmets are half-scale, and are very accurate to the helmets worn by the players. 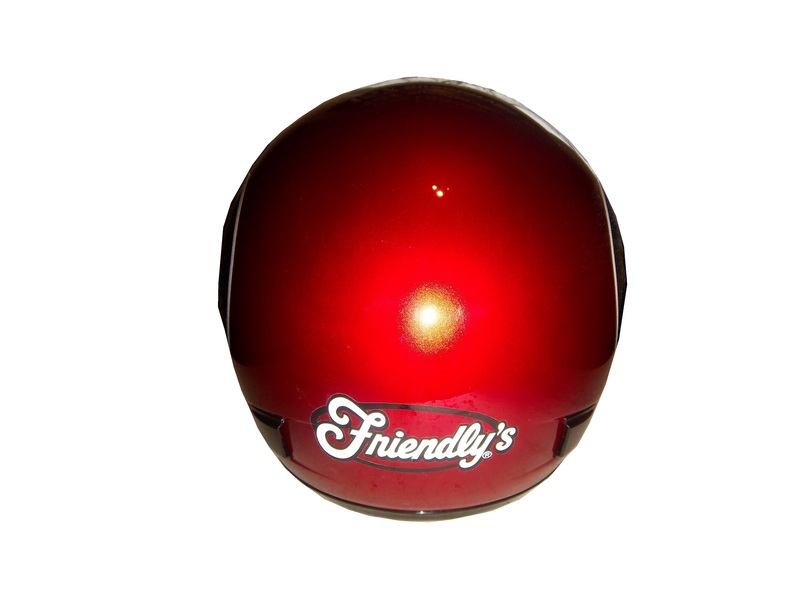 Similar to the football mini-helmet, this half-scale mini-helmet would fit the bill very well. 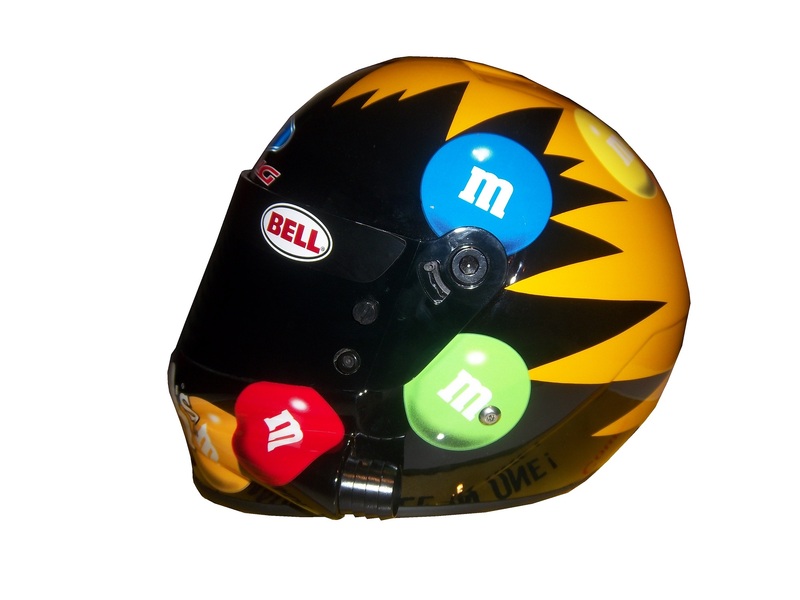 It is a replica of Elliot Sadler’s M&M’s Bell helmet from 2003-2006. 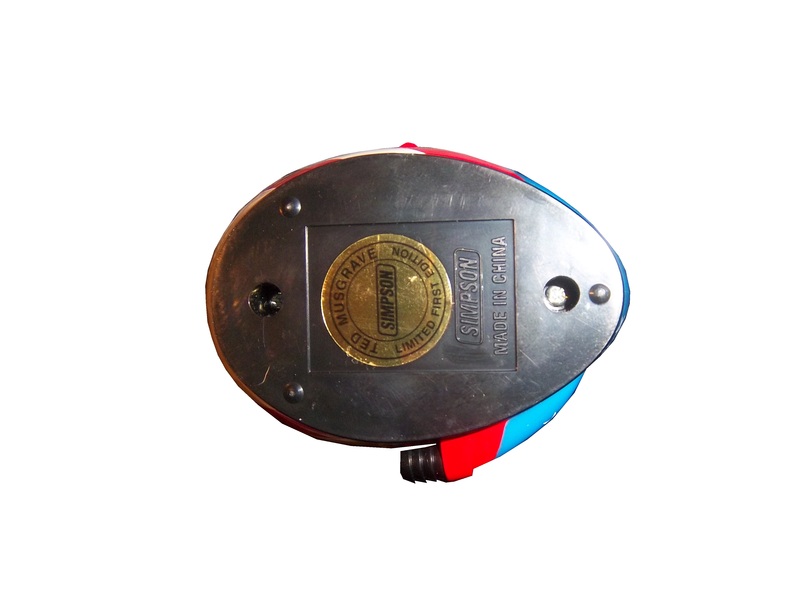 It measures 5 inches in length and is very easy for drivers to sign. A search on ebay reveals that there are minis, but not on a cohesive levels. 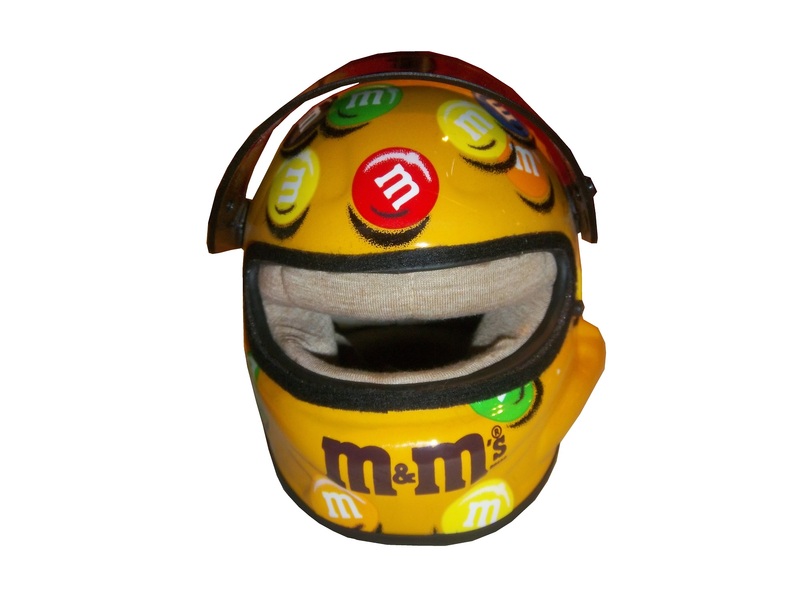 I think that fans would love to own a mini-helmet of their favorite driver, and buy new ones each season. 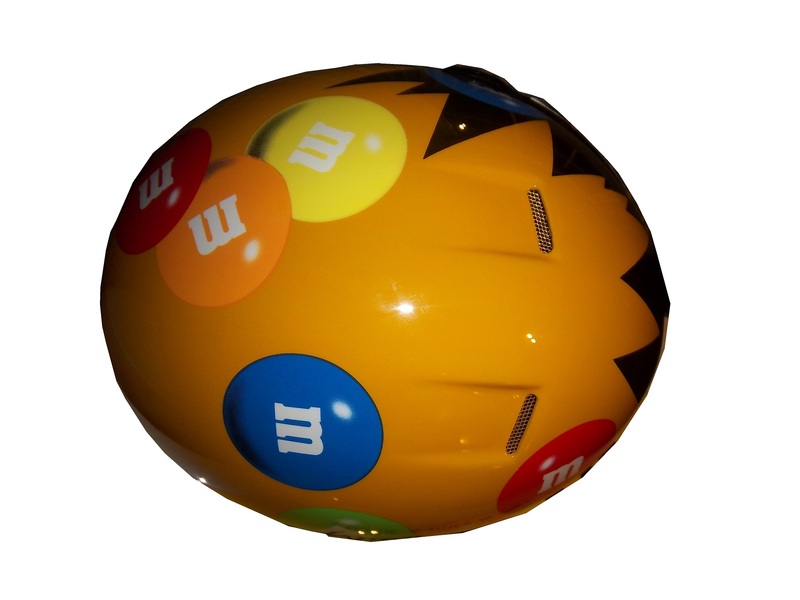 To answer the next question, yes there are full-size helmets, but they come in two different food groups. 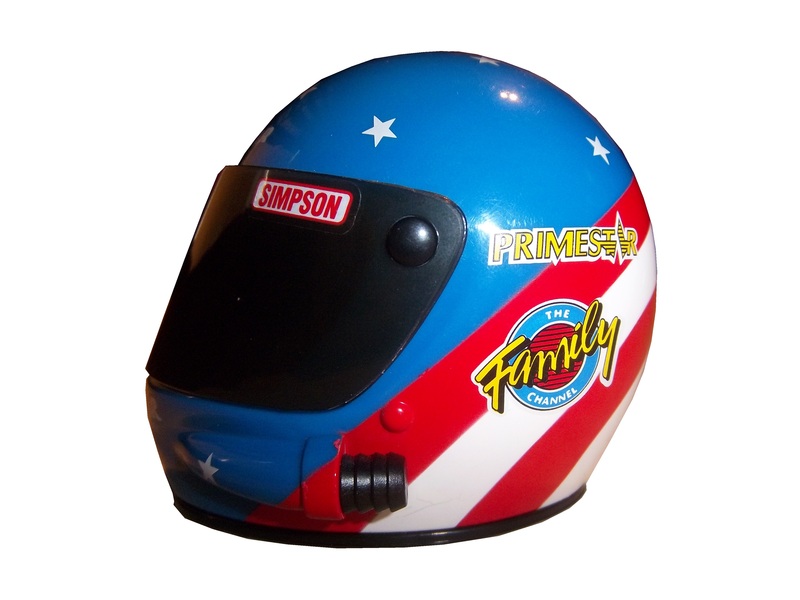 The first are helmets that are clearly replicas, such as this Derrike Cope Friendly’s replica from 2003. 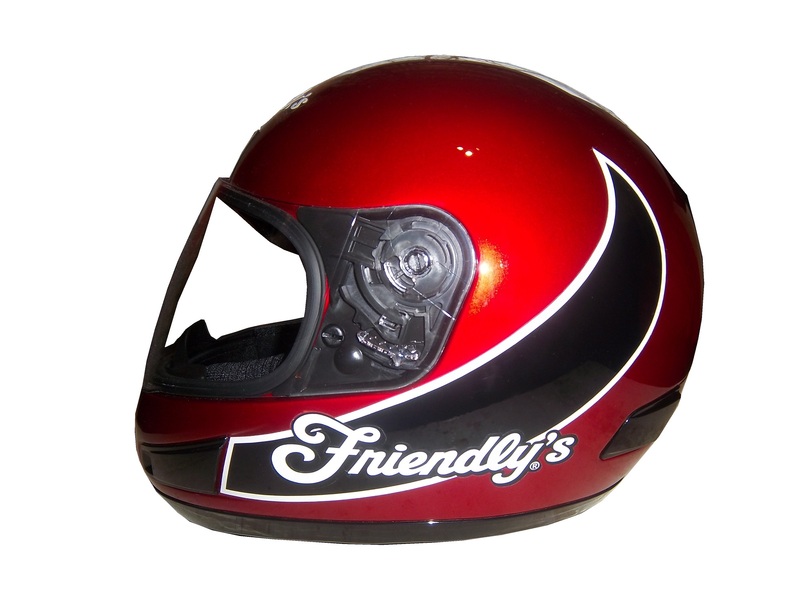 This example is clearly a motorcycle helmet, that has Friendly’s decals attached to the. Derrike has autographed the helmet on the right side. It looks good, but it is still clearly a replica. 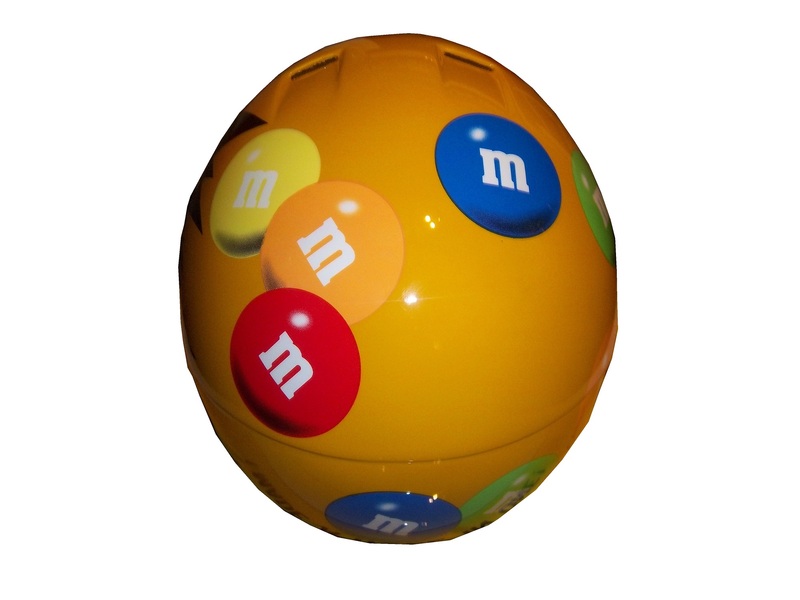 The other food group in full-size replica helmet is the helmet designed to be as accurate as possible. 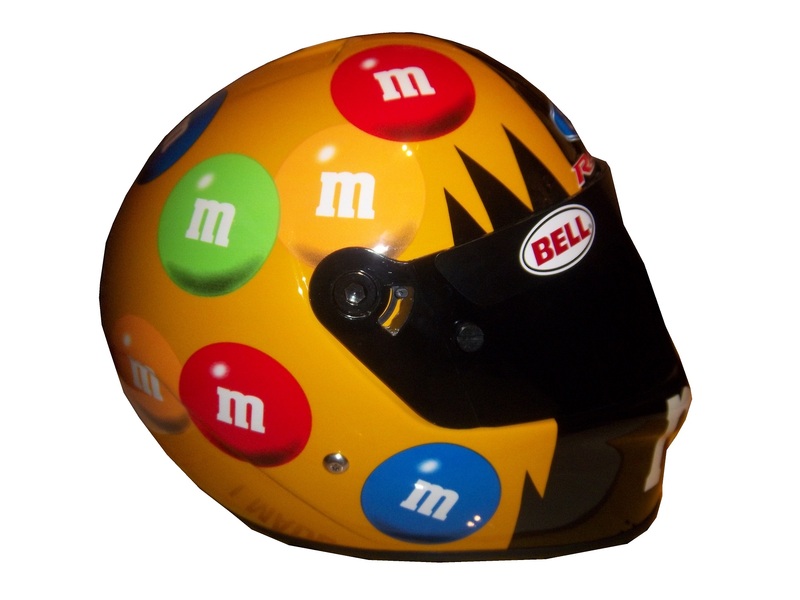 This example, again an Elliot Sadler M&M’s replica is clearly marked as being a replica and for display. 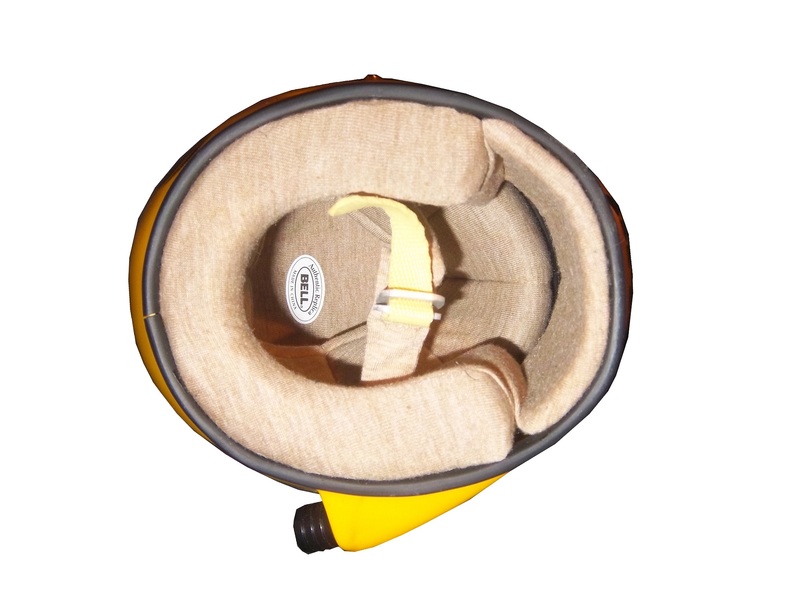 It is actually very accurate, including a ventilation hose attachment on the right side. 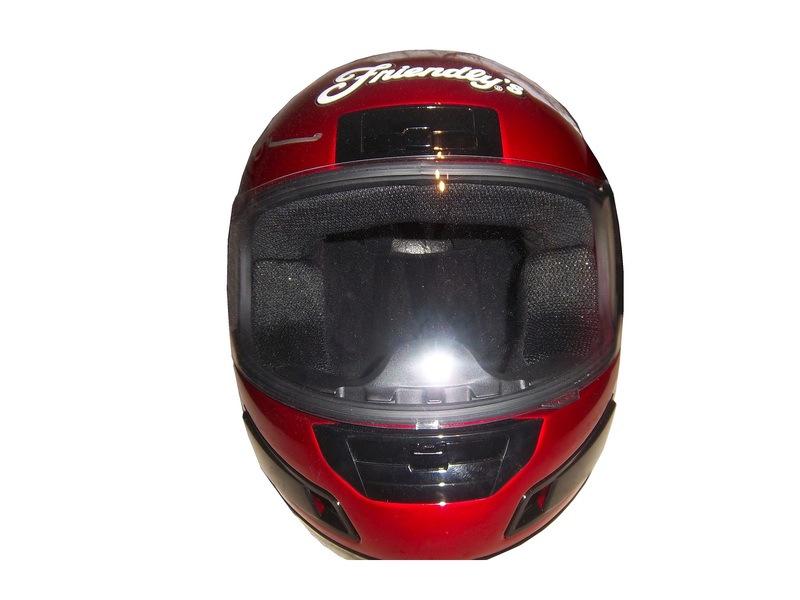 This type of helmet was common for a while, until the HANS restrictions forced the ventilation attachment to the top. 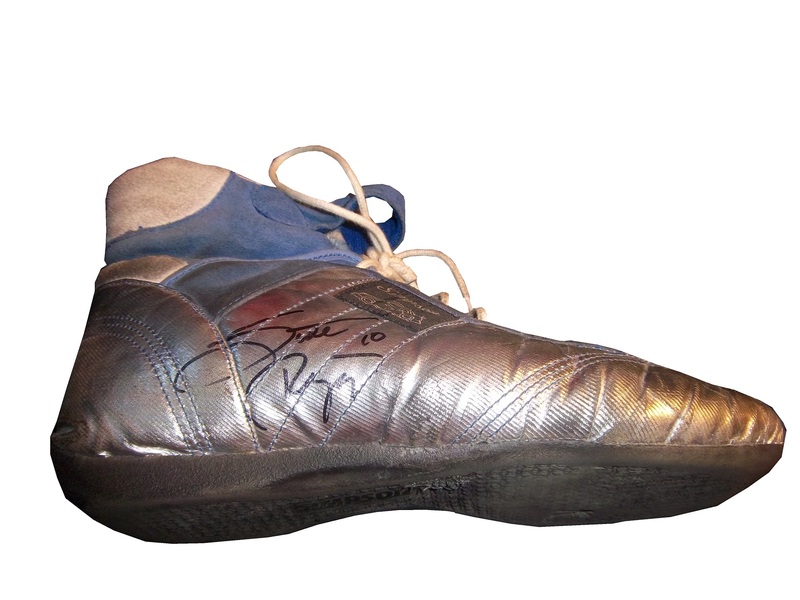 This not only works very well for autographs, but looks really nice on itself. 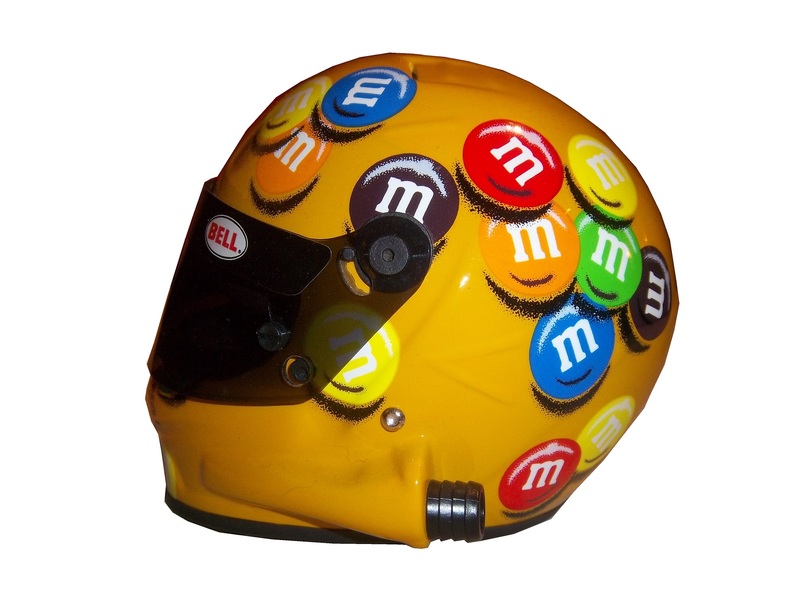 I think that the helmet companies that make driver helmets would be willing to make these helmets for the racing fan base, and I think that the racing fan base would love them as collectables! Clint Boywer #15 Gander Mtn. Toyota Camry Color scheme…good. Car design…ugh. But the thing that really irritates me is that with the gun debate in this country the hood reads “With rights comes responsibility.” Seriously? I thought Michael Waltrip’s Newton scheme at the Daytona 500 was bad, but this is just beyond bad. KEEP POLITICS AND RACING SEPARATE! F– grade! Jeff Burton #31 Childress Institute Chevy SS The only bad thing I can say about this scheme is that the door numbers are orange. If they were white with orange borders, I would love this scheme. Even so, it earns a C grade. 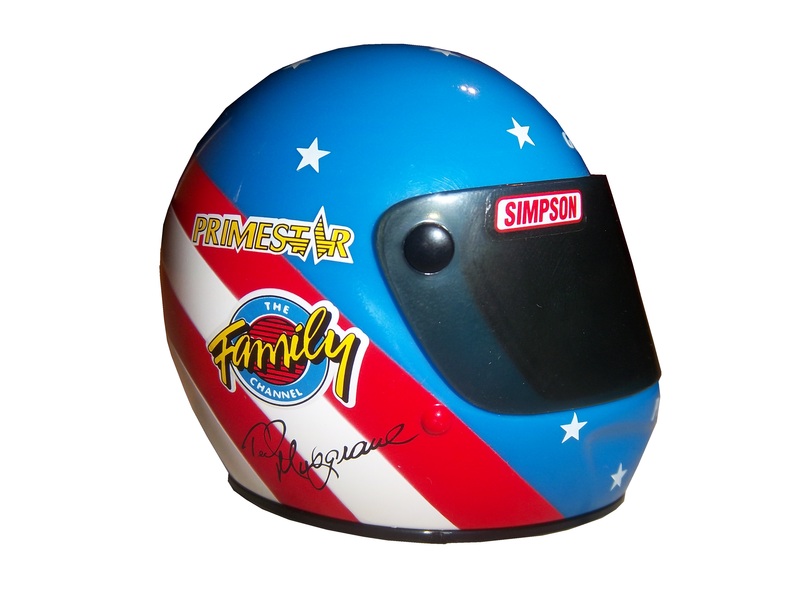 Joe Nemechek #87 Maddie’s Place Rocks! Toyota Camry They took a good scheme, with good colors and just made it look so much worse! The design is just awful, and the color scheme doesn’t help. It went from a B to a D in one week.